Touhoumon: Ordinary Version is a hack of the Silver version I am currently developing. It is a crossover between Pokemon and the Touhou series. Quite a few hacks of it have been done before, but only in 3rd gen.
Touhou is a highly-popular series of vertical bullet-hell shooters from Japan created by ZUN. The series is recognized for having an (almost) entirely female cast, who posess a variety of supernatural powers. ZUN's works have spawned countless fan creations (mangas, games, etc.) based off of Touhou, which have helped attribute to the success of his series. 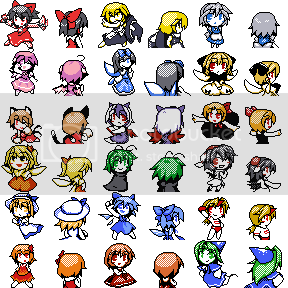 -The big draw of this hack is that the original 251 Pokemon have all been replaced by the cast from the Touhou series (they're actually just dolls made in their image in this hack), complete with their own stats and typings. -With the exception of legendaries and a couple rarities, all characters have three stages of evolution: Chibi, Normal, and EX. Chibis have a "C" in front of their name, while EX forms have an "E" in front of their name. -Maps are pretty much left intact from the original game, though a few have been changed to remove that "Pokemon" feeling. 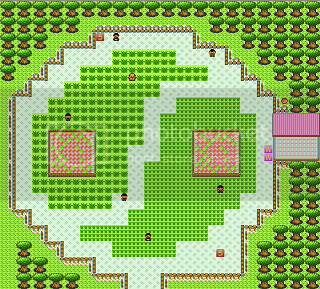 For example, the National Park has a Yin-Yang layout instead of a Pokeball. At this point, the story is mostly intact from the original Pokemon game. I'm just trying to set up the major groundwork for now. Afterwards, I may consider making a new hack using this one as a base, which would consist of a completely new region and all that good stuff. -Extra stuff (game corner, etc. ), some of this stuff is compressed. And now, a few teaser pics. A National Park that feels more Touhou. The contest has also been changed. Comments, suggestions, and maybe even offers to help out would be appreciated. Thanks for the support. And I do aim to get this completed eventually, though I can't say for certain when that will be. As of now, I've been working on TM/HM compatabilities for all the THMons, which should probably be done by the end of the day. A few TM moves have also been changed for different ones, such as TM50 now being Substitute, and TM42 now being Black Wind (a new Dark move with an effect similar to AncientPower). I might replace a couple more TM moves simply because I considered the original move to be garbage in the original GSC. Well the moves themselves I consider average, but the TMs were atrocious. Who needs a Psych Up TM? I'll tell you. No one! Well, I just finished up with all of the TM and HM assignment. I also replaced the contents of the following TMs. As the above poster stated, it's not very useful in playthroughs. I guess there's the Swagger combo, but why not just actually stat boosters? This move is the very definition of trollish design. Useless. If you really need to force encounters, use one of the Aki Sisters, they'll appear very early on and learn it eventually. Also, Razor Wind here functions much like a Flying-type Swift or Faint Attack (it never missed). Sleep Talk is many times better on Rest-based sets. I never liked moves that require the opponent to be statused (and one that isn't reliably induced) to be useable. Not to mention there needs to be a good Dark move that can be learned. Seriously, what was Game Freak thinking when they made TWO TM moves that are literally identical?! By the way, Sonicboom is very different here than the one you've known from Pokemon. Oh, and Morning Sun is now a Grass-type damaging move. If you changed Morning Sun, that means you'll probably have to change Moonlight, too. For symmetry's sake, haha. I was way ahead of you there with Moonlight, it was another move that got changed. Not gonna say what though. It's not that I don't like those moves, it's just I see no need for heaps of self-recovery moves when there's already nothing keeping the player from spamming Potions anyways (and even in the original Pokemon games, very few Pokemon I used actually did learn one of those moves). In the meantime, I've started on setting Level-up moves and Evolutions for all of the characters. I'm also interested in knowing a bit more about editing Egg Moves for once I'm done with this. Yeah, it was just tedious, but I have just completed them. I might go back and check a few of the evolutions and level-up moves before I finally insert them into the ROM (At the moment, I just have all of these saved as seperate files dedicated to each character). But for now, I've pretty much green-lighted that as completed. UPDATE: After some searching, I've also figured out and implemented the adjustments to the type chart. They are as follows. FIRE: Now neutral to Bug. WATER: Now weak to Poison. ELECTRIC: Now neutral to Steel. ICE: Now resistant to Water and Ground. BUG: Now neutral to Fire, Weak to Ice. DARK: Now resistant to Psychic, Weak to Steel. STEEL: Now neutral to Fighting, Psychic and Ghost, Resistant to Poison. Why some of these changes? -Ice was hands down the worst defensive typing in Pokemon, simply due to the sheer lack of resistance to allow for safe switch-ins... and there are quite a few of them here. Giving Ice these two resistances should give it some better defensive ability. -Unlike Pokemon, Bug is a rare type in Touhoumon. Removing at least one unfavorable matchup should help. -With Dark-types being rather common in this hack, it seemed cruel to leave them immune to Psychic (another common type). -Steel was a ridiculously good defensive typing... and there are a good amount of Steel-types in this hack. Removing some those resistances was necessary in order to make it far less annoying to deal with, and far less overpowering for the player to use. On the plus side, it's no longer weak to Fighting, Electrics no longer resist it, and it's super-effective against the rather common Dark-type. Not bad but what you should also do is to introduce how the types affect each other in game too so the player won't get confused by relying on the original list. I intend to include the revised type chart, among other things (a readme being an obvious one), in a .ZIP file with the hack. I may also change some in-game texts to reflect these changes. Having a school where they teach about these kind of things would be a nice add-on. Feel free to do anything else too but that's just a simple idea. I like how you tried to balance the types in accordance with the wild Touhoumon. Do you plan on creating new scripts and such? With most of the statistical work done, I've finally decided to move my focus towards the spriting. Like I mentioned in the original post, Touhoumon originally existed as a 3rd gen hack. Thus, most of this spritework will be devamps of that hack. Even if you consider it's mostly devamp, respriting all 251 'mons is going to take a while, and I'm accepting any offers to help take some of the load off of me. For example, let's take a look at Chibi Sakuya (before and after). Since the GBA games used bigger sprites (up to 64x64 was allowed), resizing is necessary for a lot of them, as many EX forms used the full dimensions of the sprite! Like for example, I wanted Chibi Mugetsu to be smaller (though the backsprite was left alone, that might get resized too...). At the moment, I've just been using Paint for this, though I'm getting the feeling there's probably an easier/quicker way to do this. With that said, if anyone is interested in helping out with the spriting, just let me know, and I'll send over the original 3rd gen sprites for you to devamp. Ignore shiny palettes--I will determine those in the end. A few of the sprites are... kinda ugly in my opinion compared to the newer ones that are in the latest Japanese version (i.e. CPatchouli), but the problem with that version is, they ditched 3-step evolutions for multple branches, meaning no proper Normal/EX Forms that actually show distinction. So if anyone is feeling artistic, redrawn sprites are also acceptable. I'm probably the worst spriter ever, so I can't help you with that, but there are a lot of good spriters on the forum! But I agree that Gen II does have its limitations compared to Gen III and maybe that's why no one has created a Touhou hack for it. Don't let that discourage you, though. I know a way to make the palette limitations easier - try resizing it and saving it as a 16-bit BMP, then using the eraser trick. It makes it much easier. However, it can corrupt the colors that are already there, so I recommend color-picking the original sprite for the palette. It should make the palette limitations easier. I know I'm new and this is going to sound really demanding, but I really need this rom right now, lol. The eraser trick is available on Microsoft Paint. To use it, you color pick one color with left click and another with right click. Then, select eraser and right click and drag along the sprite. It is the same as the normal eraser but only replaces the left click color rather than every color, and as always, uses the right click color. Wow! I am really loving those sprites! I am just itching for the release haha. Well, I think I've made enough progress so far to start making preview videos. Here's the first one, of a revised Falkner battle.